External storage refers to file storage that is not on internal storage and not exclusively accessible to the app that is responsible for the file. The primary purpose of external storage is to provide a place to put files that are meant to be shared between apps or that are too large to fit on the internal storage. Historically speaking, external storage referred to a disk partition on removable media such as an SD card (was also known as portable storage). This distinction is no longer as relevant as Android devices have evolved and many Android devices no longer support removable storage. Instead some devices will allocate some of their internal non-volatile memory which Android to perform the same function removable media. This is known as emulated storage and is still considered to be external storage. Alternately, some Android devices may have multiple external storage partitions. For example, an Android tablet (in addition to its internal storage) might have emulated storage and one or more slots for an SD card. All of these partitions are treated by Android as external storage. On devices that have multiple users, each user will have a dedicated directory on the primary external storage partition for their external storage. Apps running as one user will not have access to files from another user on the device. The files for all users are still world-readable and world-writeable; however, Android will sandbox each user profile fromthe others. Reading and writing to files is almost identical in Xamarin.Android as it is to any other .NET application. The Xamarin.Android app determines the path to the file that will be manipulated, then uses standard .NET idioms for file access. Because the actual paths to internal and external storage may vary from device to device or from Android version to Android version, it is not recommended to hard code the path to the files. Instead, Xamarin.Android exposes the native Android APIs that will help with determining the path to files on internal and external storage. This guide will discuss the concepts and APIs in Android that are specific to external storage. Private files – Private files are files that are specific to your application (but are still world-readable and world-writable). Android expects that private files are stored in a specific directory on external storage. Even though the files are called "private", they are still visible and accessible by other apps on the device, they are not afforded any special protection by Android. Public files – These are files that are not considered to be specific to the application and are meant to be freely shared. The differences between these files is primarily conceptual. Private files are private in the sense that they are considered to be a part of the application, while public files are any other files that exist on external storage. Android provides two different APIs for resolving the paths to private and public files, but otherwise the same .NET APIs are used to read and write to these files. These are the same APIs that are discussed in the section on reading and writing. Private external files are considered to be specific to an application (similar to internal files) but are being kept on external storage for any number of reasons (such as being too large for internal storage). Similar to internal files, these files will be deleted when the app is uninstalled by the user. This document will refer to the storage directory for private files on external storage as PRIVATE_EXTERNAL_STORAGE. For devices that have multiple external storage partitions, each partition will have a directory that is intended for private files. The method Android.Content.Context.GetExternalFilesDirs(string type) will return an array of Java.IO.Files. Each object will represent a private application-specific directory on all shared/external storage devices where the application can place the files it owns. The exact path to the private exteral storage directory can vary from device to device and between versions of Android. Because of this, apps must not hard code the path to this directory, and instead use the Xamarin.Android APIs, such as Android.Content.Context.GetExternalFilesDir(). This document will refer to the storage directory for public files on external storage as PUBLIC_EXTERNAL_STORAGE. Android also supports the concept of application directories on PUBLIC_EXTERNAL_STORAGE. These directories are exactly the same as the application directories for _PRIVATE\_EXTERNAL\_STORAGE_ and are described in the table in the previous section. The method Android.OS.Environment.GetExternalStoragePublicDirectory(string directoryType) will return a Java.IO.File object that correspond to a public application directory. The directoryType parameter is a mandatory parameter and cannot be null. The exact path to the public external storage directory can vary from device to device and between versions of Android. Because of this, apps must not hard code the path to this directory, and instead use the Xamarin.Android APIs, such as Android.OS.Environment.ExternalStorageDirectory. Once a Xamarin.Android app has obtained the full path to a file, it should utilize any of the standard .NET APIs for creating, reading, writing, or deleting files. This maximizes the amount of cross platform compatible code for an app. However, before attempting to access a file a Xamarin.Android app must ensure that is it possible to access that file. Verify external storage – Depending on the nature of the external storage, it is possible that it might not be mounted and usable by the app. All apps should check the state of the external storage before attempting to use it. 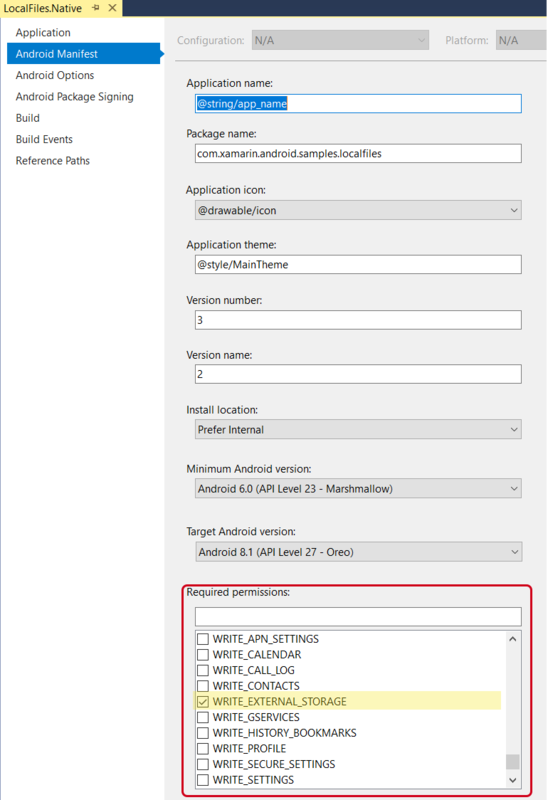 Perform a runtime permission check – An Android app must request permission from the user in order to access external storage. This means that a run time permission request should be performed prior to any file access. The guide Permissions In Xamarin.Android contains more details on Android permissions. Each of these two tasks will be discussed below. MediaBadRemoval The media was abruptly removed without being properly unmounted. MediaChecking The media is present but undergoing a disk check. MediaEjecting Media is in the process of being unmounted and ejected. MediaMounted Media is mounted and can be read or written to. MediaMountedReadOnly Media is mounted but can only be read from. MediaNofs Media is present but does not contain a filesystem suitable for Android. MediaRemoved There is no media present. MediaShared Media is present, but is not mounted. It is being shared via USB with another device. MediaUnknown The state of the media is unrecognized by Android. MediaUnmountable The media is present but cannot be mounted by Android. MediaUnmounted The media is present but is not mounted. Android considers accessing external storage to be a dangerous permission, which typically requires the user to grant their permission to access the resource. The user may revoke this permission at any time. This means that a run time permission request should be performed prior to any file access. Apps are automatically granted permissions to read and write their own private files. It is possible for apps to read and write the private files that belong to other apps after being granted permission by the user. If the user grants WRITE_EXTERNAL_STORAGE, then READ_EXTERNAL_STORAGE is also implicitly granted. 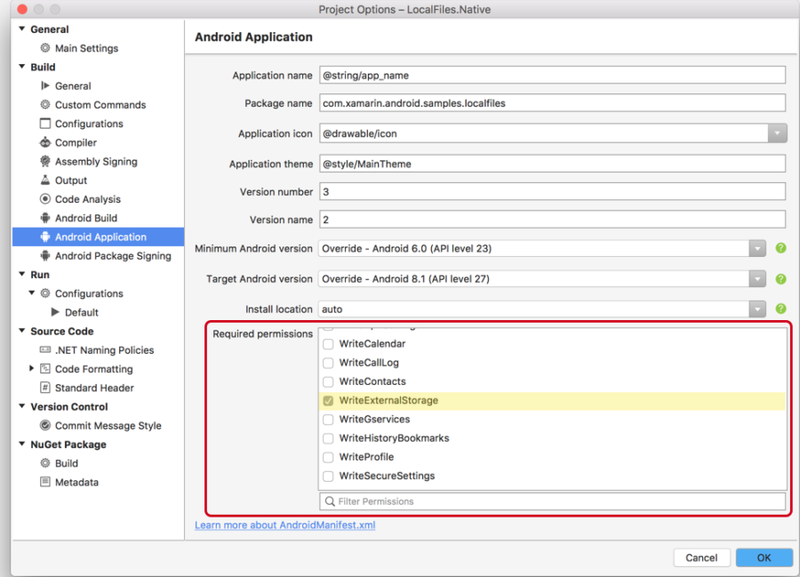 It is not necessary to request both permissions in AndroidManifest.xml. 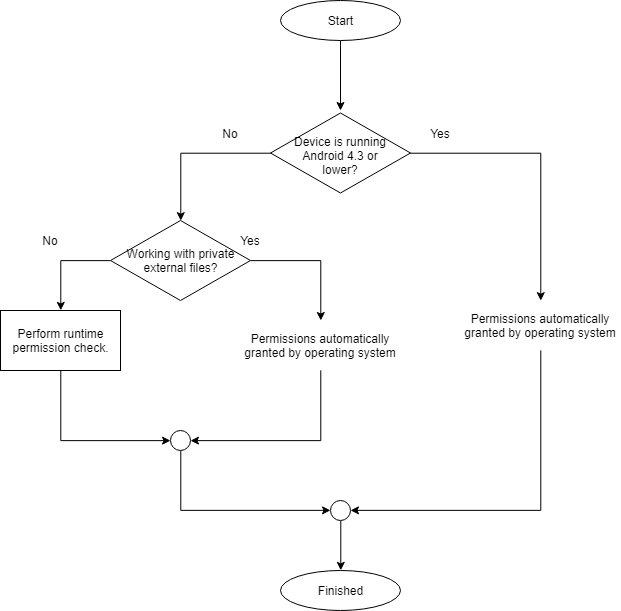 For more information on performing runtime permission requests, please consult the guide Permissions In Xamarin.Android. The monodroid-sample LocalFiles also demonstrates one way of performing runtime permission checks.